4. Expecting your cat to listen without training. Your cat’s not ignoring you — he doesn’t instinctively know what you’re asking him to do or why it’s worth doing. Don’t assume that words like “off,” “down” and “stop” mean anything to your cat simply because you say them all the time. If you want your cat to get off the counter, you will need to use positive reinforcement — not punishment — to teach him what “off” means. You will also need to teach him an alternative behavior, like going to his bed or cat tree, to replace the one you are asking him to stop doing. Be patient: With practice, he will learn that “off” means he should abandon the counter and go to his bed — and that doing so will earn him a treat of some sort. 5. Setting unrealistic training goals. Every cat learns at his own pace: One cat might learn how to get in and out of his crate after only a few tries while it might take another cat days just to get comfortable being in the room with the crate. Pushing your cat to learn too much or go too fast means skipping needed reinforcement, which can lead to frustration and confusion and can increase the likelihood that your cat — and you — will give up on training. Increase the difficulty of training at a pace that keeps your cat engaged, but be cautious — slowing your pace to baby steps creates more opportunities for your cat to succeed and helps to build his confidence. And keep in mind that all those little steps add up to big steps — and potentially big changes in your cat’s behavior. One last thought: If all else fails, don’t be afraid to ask for help. 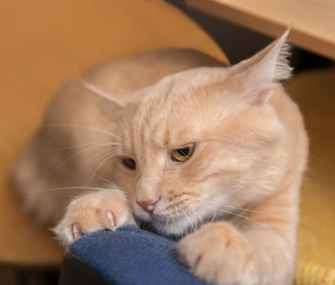 If your cat’s issues aren’t getting better with consistent training or the problems are especially concerning, like aggression or failure to use the litterbox consistently, seek help from your veterinarian, who may refer you to a veterinary behaviorist. Your vet can help identify any medical issues that may be to blame for changes in your cat’s behavior and habits, while a veterinary behaviorist or trainer can provide individualized training advice tailored to your cat’s issues.